When I decided to do a review of King's Grocery and Deli, my intention was to write about Hunt Brothers Pizza. This brand of pizza is sold in many convenient stores in America, including the ones in Memphis' Vollintine-Evergreen neighborhood (the exceptions are Mapco and Mid Town Mini Mart, which has a great beer selection). However, in doing my research on King's, I discovered that it serves East African food. That really piqued my interest because I've been on a quest to try all of Memphis' African restaurants. 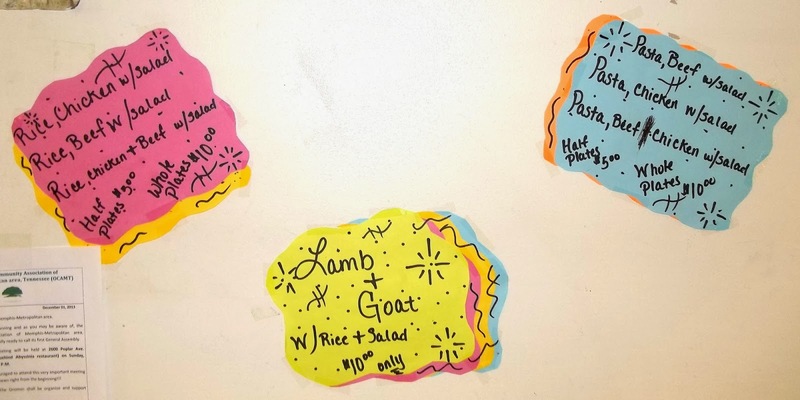 My journey has me to places such as Whitehaven's Africa Restaurant that serves West African dishes to Raleigh's Somali-centric Salaama Restaurant and Market. Although I enjoyed all those places (except for one), I longed for an African Restaurant close to home. Actually, there was one that used to be close by (Genery) but it recently closed. I don't know the reasons for its demise, but if poor customer service was a factor, I'm not surprised. I didn't have good experiences in either of my visits to Genery, and I'm guessing others might not have had any. But Genery's loss could be King's gain. King's has actually been around for several years. When it opened, the grocery/deli was run by African-Americans (aka American-born blacks) who served soul food. If they were still running the place, I'm sure my friend and fellow V & E resident Craig of the brilliant blog Memphis Que would have reviewed it. In addition to the obvious, Craig's niche is soul food that goes hand-in-hand with barbecue. Although I technically don't specialize in any one cuisine, as one of Memphis' two black food bloggers that I know of, (the lovely Tiffany Langston of Tiffany Tastes being the other), I decided to take it upon myself to highlight restaurants of the Motherland. That said, I couldn't resist a restaurant that I see every morning when I jog. It took awhile to find time to make an "official" visit (as opposed to my typical "beer runs" and cravings for deli meat), but last Wednesday (August 8, 2012) was the day that I stopped by. The kitchen for Ethiopian food is normally open daily from 10 a.m. to 7 p.m., but because my visit was during Ramadan, the kitchen wasn't open during my initial visit at 11:30 a.m. The deli's cashier told me that the cook wouldn't open until 12:00 p.m. (and closes at 9:00 p.m.) Upon learning this, I went home and waited 45 minutes before returning at 12:15 p.m. From past experiences, I've learned that Africans don't abide by a strict schedule, so I wasn't surprised that the cook wasn't there on the second visit. After hanging out at the Flying Saucer for a couple of hours, I went there again. Fortunately, the third time was the charm. 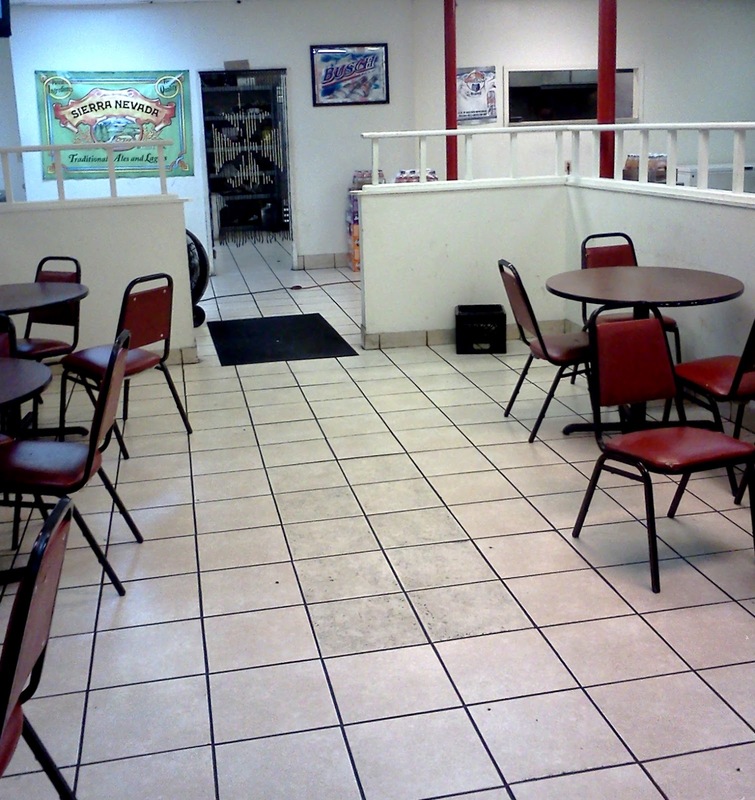 The "restaurant" portion of King's consists of a small dining area in back of the store with the kitchen behind it. To place an order, one must go to a window in the wall separating the kitchen and dining area. Because King's lacks printed menus, the cook has to recite everything that's being served that day. I personally don't like that, because it doesn't give me a chance to carefully review everything prior to ordering (UPDATE: King's now has a menu). Therefore, I impulsively chose the fish and rice plate with a side salad because I haven't had an East African seafood dish. After I placed my order, I asked the cook if the food was Somali (I was told this by the cashier). The cook answered "Ethiopian" and said that it was the same as Somali cuisine. Not that I'm an expert, but saying that all East African cuisine is the same is like saying Memphis and Kansas City barbecue are interchangeable. Like with barbecue, there are subtle differences in East African cuisine. Still, I avoided debating him by nodding my head and took a seat at a table. After about ten minutes, my order was ready. The "fish" component of the meal was two tender catfish steaks, which I thought was strictly within the domain of Southern United States cuisine. Ground beef topped the rice, which made it easier to eat with a fork. Everything (minus the salad) was seasoned with what I believe was Ethiopian Berebere, which is a combination of pepper and other spices. It was very spicy and judging from the taste of it, it seemed that chili pepper was a part of it. Fortunately, the side salad, drenched in cucumber-flavored vinaigrette, provided a cool balance to the fish and rice. In all, everything was wonderful and well worth the wait. The meal itself was huge. For ten dollars, I got enough food for two people so it stands to reason that I didn't I eat everything at the deli. After knocking out half of it, I packed up the rest and took it home. The next day, I ate the leftovers that consisted of one catfish steak and most of the rice. Unlike the water I had with it the day before, I ate the rest of it with a Corona Light that nicely complemented the meal. The light malty flavor of the lager meshed well with the unique spiciness of the Ethiopian meal. Halfway through my meal, I had finished off the catfish, so I mixed in smoked sausage as a substitute. While not a perfect match, it worked well with the rice and provided a good finishing touch to my lunch. While I enjoyed my lunch, it wasn’t a genuine Ethiopian experience. Based on my visit to Abyssinia and what I’ve seen on TV shows like Anthony Bourdain’s No Reservations, my lunch at King’s didn’t seem like the real deal. First, my meal didn’t come with Injera bread, a staple of Ethiopian cuisine. It is thin spongy bread that is used in pieces to pick up other morsels of food, thereby allowing a diner to eat with his/her hands. When I dined at Abyssinia, I was clueless about the bread’s purpose and ate everything with a knife and fork. Only later through TV shows on the Travel Channel did I learn of Injera bread’s purpose. I’m not sure why King’s doesn’t serve it, for making it is similar to cooking crepes. The way I see it, an Ethiopian restaurant not serving Injera is like a Mexican restaurant not having tortillas. By the way, Somali cuisine has a similar bread called Canjeelo (or Lahooh), but some of the ingredients used to make it (including the dough) are different from Injera. The meal itself, while dubbed “Ethiopian” by King’s cook, was likely Somali. Most Ethiopian dishes are either stews or Tibs (aka Tibes) which is a type of sautéed entrée. The meal I had consisted largely of rice, which is a key component in many Somali dishes such as Suqaar, a beef stew entrée that I had at Salaama. By the way, I’m not saying that rice isn’t a part of Ethiopian cuisine, but from what I’ve seen and read, it seems to be more of a side item. Also, while reciting the menu, the cook mentioned some spaghetti entrées. At first, I thought this was King’s way of accommodating the locals, but I’ve learned that pasta is a part of Somali cuisine due to the country’s legacy as a former Italian colony. And because the country is located on the Horn of Africa, maritime trade has also allowed culinary influences from Ethiopia, The Middle East, India and Southeast Asia into Somali culture. 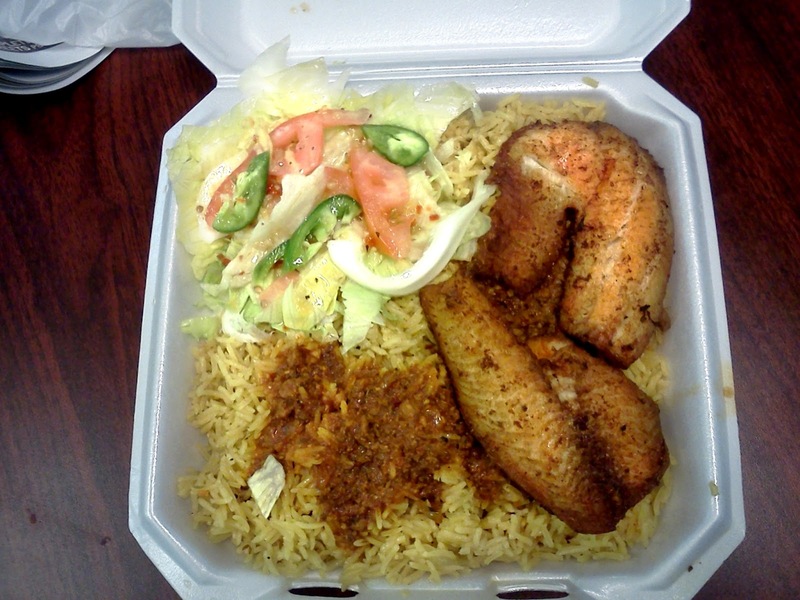 In the end, I believe that both the deli’s cashier and cook were right, for my meal was likely a Somali/Ethiopian hybrid. Still, it was satisfying and I look forward to ordering it again. UPDATE: Speaking of spaghetti, I recently (December 26, 2013) went back to King's for one of its pasta dishes. I got a "half plate" of pasta mixed with Suugo (also spelled "Sugo"), a Somali pasta sauce. 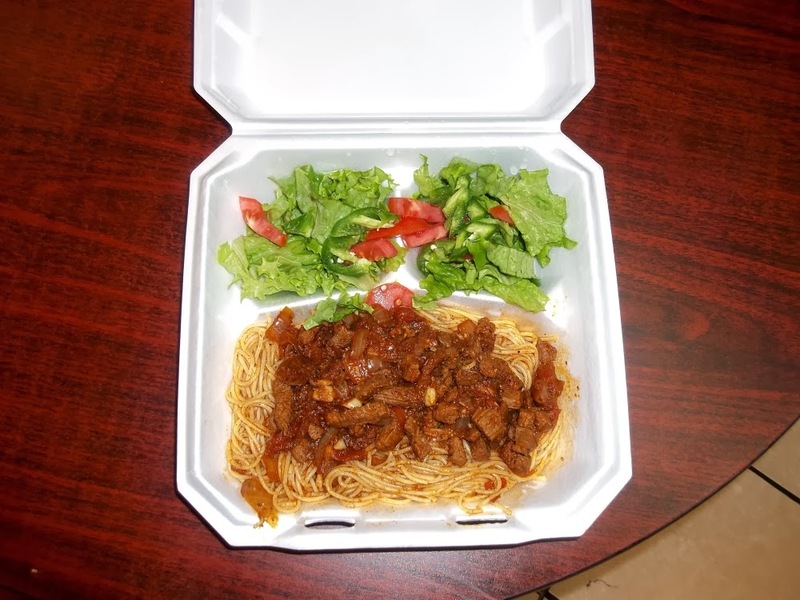 The main component in the African pasta is boiled beef cubes (similar to Suqaar; defined by some as "Suugo Suqaar"). Unlike the last meal, the spaghetti was mildly spicy but I still enjoyed it. As for my gripe about the deli not having a printed menu, it now has one posted on its wall. I'm glad it has it, for I now know that I can get a "half plate" for five dollars as opposed to ordering a "whole plate" that is usually more than I need. Good Pizza That's Worth The "Hunt"
With the first objective complete, I refocused on my original goal. Three weeks after having an East African lunch. I decided to get my first Hunt Brothers pizza. My expectation of its quality was something akin to typical frozen pizza like DiGiorno. As sort of a side item, I also got a single order of Hunt Brothers' Hot 'n Spicy Wings. I didn't expect much from the wings either, but both turned out well in the end. The pizza I ordered was a pepperoni pizza. Unlike most pizza joints, Hunt Brothers pizzas come in only one size, twelve inches. I wished I could have gotten something smaller, but the excess allowed me to share the pizza with my mom. As for crust, my options were "original" and thin. For the purpose of comparison, I chose the thin crust. It's also the reason why I chose pepperoni, for it's the one ingredient that nearly all pizza-serving restaurants have on their menu, including the Majestic Grille (called "flatbreads" on its menu). Even though I only chose pepperoni, I could've gotten up to ten toppings on it and still paid the same price of $9.99. In hindsight, I should've gotten half the pizza loaded with toppings and the other half with just pepperoni. If I decide to get another pizza, I will do that and amend this review accordingly. As for the pizza I had, I was very satisfied with what I got. The crust was the best part of the pizza. Although it was a thin crust, it was slightly thicker than average. While its edges were crispy, the crust's interior was fluffy and chewy with a taste akin to fresh bread. This took me by surprise, given that the dough for the crust was likely pre-made at a distant Hunt Brothers' facility. To maintain that freshness, good Quality Assurance standards are essential. 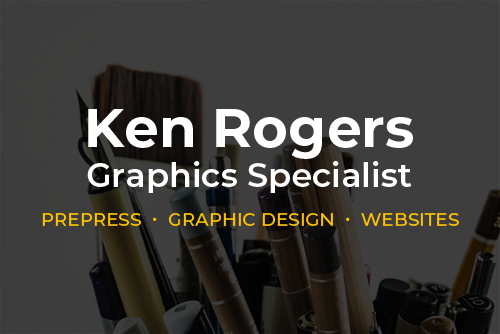 Seemingly, Hunt Brothers have those in place and King's is adhering to them. 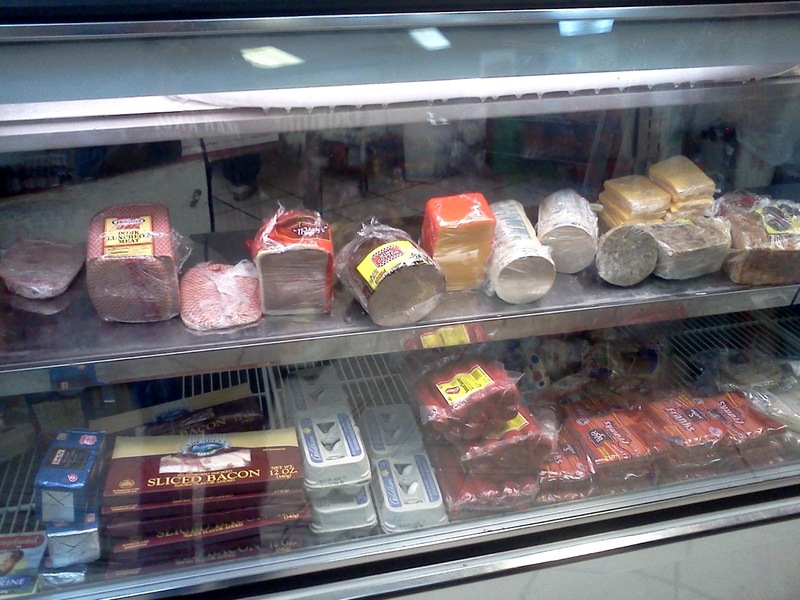 For that, I want to commend the deli for its efforts. The rest of the pizza was quite good, too. The taste of the tomato sauce and pepperoni were on par with most pizza joints. With particular regard to the pepperoni, it was fresh with all the zesty characteristics associated with it. To literally top it off, Parmesan cheese added a savory kick that accentuated the pizza's flavor. In all, I was quite impressed because the pizza exceeded my expectations. For those who only want a slice, Hunt Brothers can accommodate that. 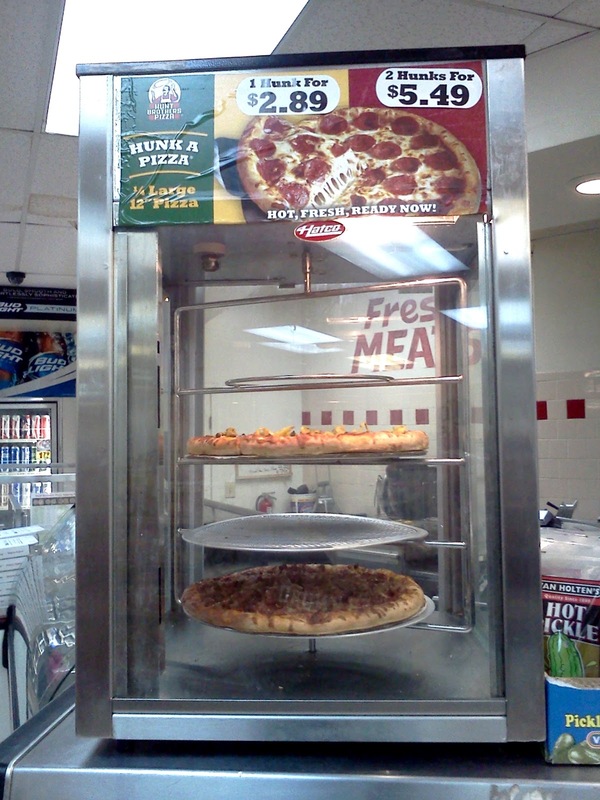 Called "hunks," the slices are served from pizzas encased in a glass roaster. From my experiences, food that is prepared beforehand doesn't hold up well (I talk about this in detail in my review of Jack's Bar-B-Q Rib Shack). However, at $2.89, it is a cheaper alternative for those with small appetites. The Hot 'n Spicy wings were quite decent for what they were, frozen wings that were heated in the same oven as my pizza. 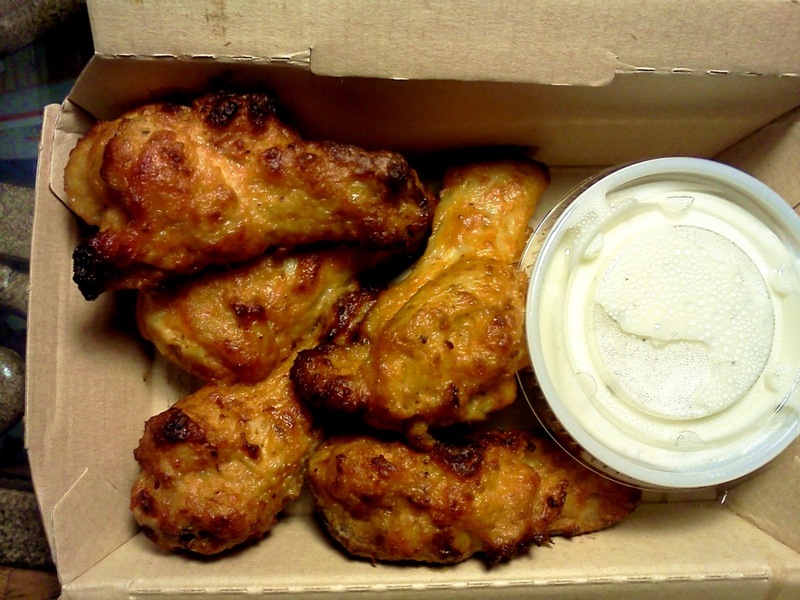 For Buffalo wings, they were not doused with a lot of sauce which led to a mess-free experience. Also typical with hot wings served from places like Pizza Hut, they lacked the crispiness that deep fried chicken should have. Although the wings were spicy, they weren't nearly as hot as its name would imply. The wings could be called "Mild 'n Spicy" because while they had some pepper flavor, it wasn't overwhelming. 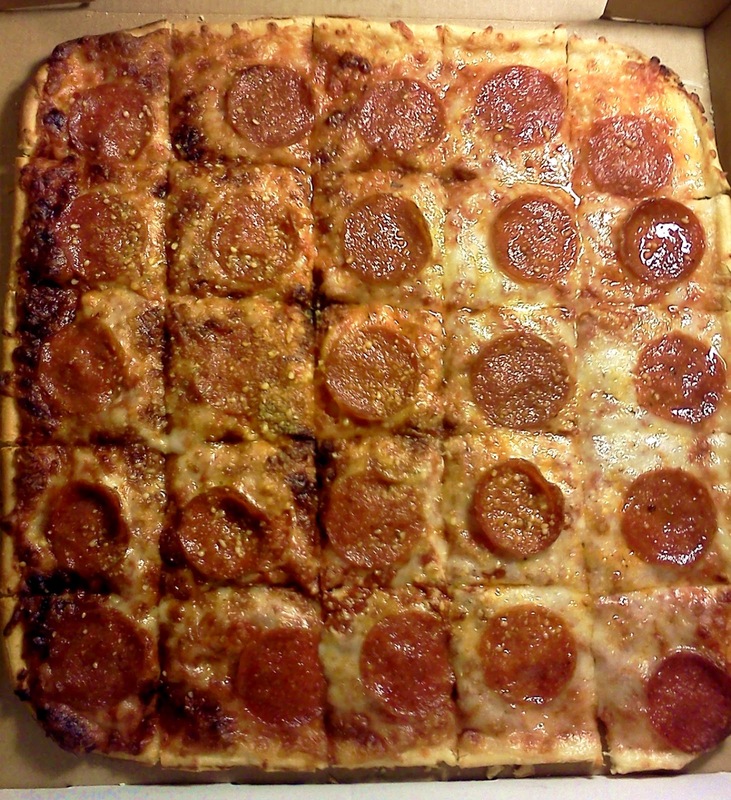 As a "side" for the pepperoni pizza, it complemented it well and rounded out my dinner. Overall, my first Hunt Brothers experience was a positive one. Based on the pepperoni pizza I had, I will say that Hunt Brothers rate above most frozen pizzas and "budget" eateries like CiCi's and lower than restaurant chains such as Domino’s and Papa John's. It's definitely better than the over-hyped Memphis Pizza Cafe that somehow manages to get top honors in every survey rating Memphis' top restaurants (it's the pizza equivalent of Huey's, but worse). I also like the availability of the numerous franchises that sell the pizza. You can't go a quarter-mile in any direction without running into one. Unfortunately, most of the convenient stores that have them don't have a dining room like King's where a person can dine-in if needed. Other than this drawback, I don't think too many people will be dissatisfied with anything from Hunt Brothers. In conclusion, although my two experiences at King's Grocery and Deli were vastly different, both resulted in positive outcomes. For me, the experiences were very enlightening for I know more about East African cuisine and places to get a good pizza. As this concerns King's, I hope the word gets out in the neighborhood that it is a viable dining option to be considered along with places like Cafe Eclectic and Cave's Soul Food and More. The quality of its food earned a place among my choices within the neighborhood, and I will exercise it often. It's that good.